Thank you to Michele Krugh for her hard work as President and to Barbara Cain for her hard work as treasurer this past year. 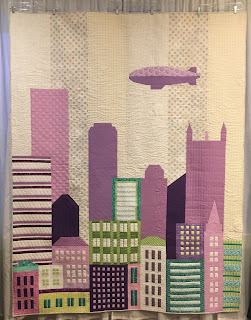 Our QuiltCon charity quilt bound and complete. 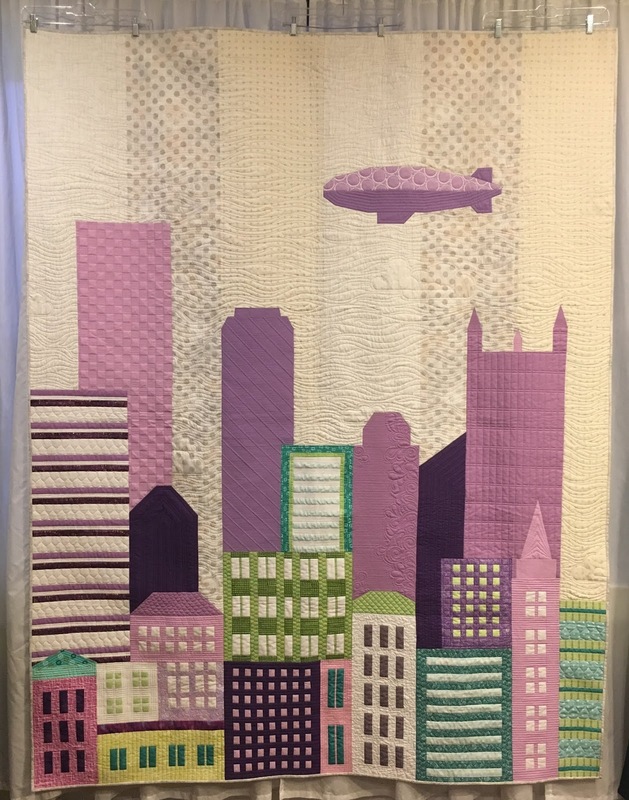 Thanks to all who made blocks, helped with assembly, and a big shout out to Nikki for the quilting and Amanda for binding the quilt and preparing it to hang at QuiltCon! Our guild is working on a quilt for the Tree of Life First Responders. 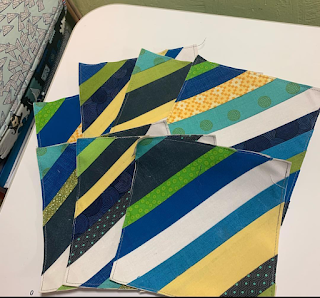 Members are asked to make 6" square (finished) string blocks using yellow, blue, and green with a white stripe in the middle. Blocks are due at the February meeting. Cheralee, Karen and Laurie are in charge of the project. It's a really great exhibit, and the museum has free admission. It's worth the drive! The Pittsburgh Creative Arts Festival is held at the DoubleTree Hotel in Green Tree. Show date March 15-17. Members get a coupon code for $5 off if you buy your ticket in advance. 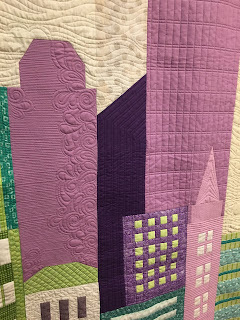 The design inspiration quilt challenge is due in March 2019. The color palette is yellow, blue, red, black, white and gray for these minis, and the inspiration is pop art. The quilts must be 24"tall x no more than 48" wide. The mini quilts will be displayed at the Mt. 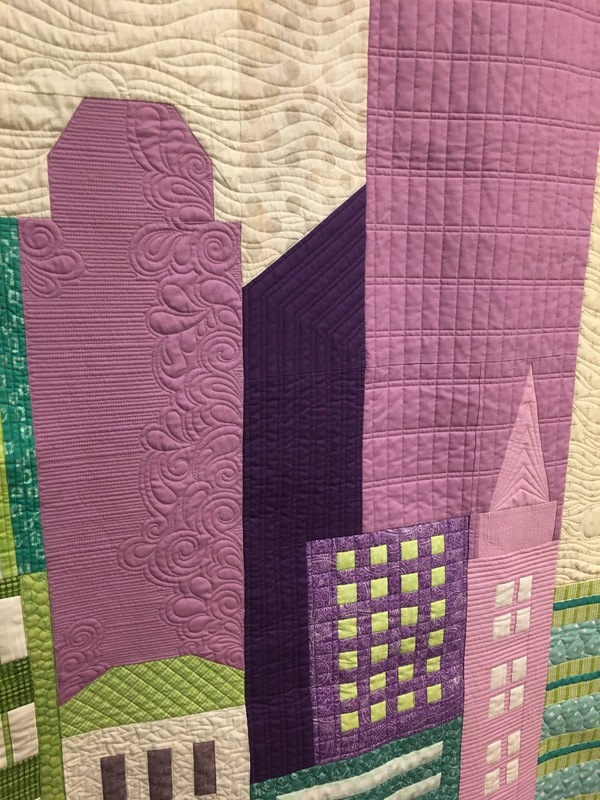 Lebanon Library in the summer of 2019 and at the Pennsylvania National Quilt Extravaganza in September 2019. The winner of the 2018 UFO challenge raffle is Courtney! Congratulations!! Mark your calendars for our retreat, Friday-Sunday, April 5-7 at the Martina Spiritual Retreat Center. More info coming soon. We hope to see you at our next meeting on February 3rd. The meeting topic will be blocking a quilt.